in a show we are calling CONTRASTS & SIMILARITIES. and yet, as you will see, there are many similarities as well. Leo Gonçalves I am Brazilian. I was born in the state of Minas Gerais. I started drawing when I was small. Everything I know today I pretty much taught myself. I did not have teachers, so I learned to draw by myself and later entered the profession of graphic design and illustration in Brazil. I won some bids for printing, postage on postal, work for magazines and graphic design in general. I am specifically a designer and an illustrator. I am married and have a daughter. For the last two years, I have devoted myself to working with Xara Xtreme, as you can see the work posted here. Paul Söderholm lives in Raisio, Finland. He is a graphic designer at the oldest Finnish newspaper (Åbo Underrättelser, 184 years old). With a background in computer science. 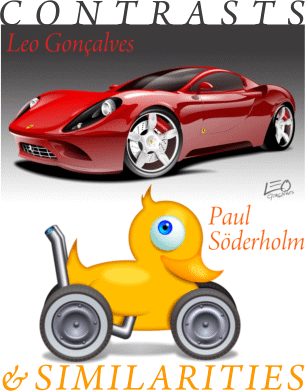 Paul has provided his illustration and design services on the side since 1995 and his trademarks are the gnurf cartoon characters and digital rubber ducks. His favorite tools are pen and paper, Xara Xtreme and Photoshop, but is an experienced user of many less popular tools as well.